Carefully measuring resin and hardener and thoroughly mixing epoxy are essential for a proper cure. Whether your mixing epoxy resin and hardener to apply as a coating or to modify with fillers or additives, observing the following procedures will assure a controlled and thorough chemical transition to a high-strength epoxy solid. VIDEO: Dispensing and Mixing WEST SYSTEM Epoxy. 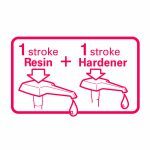 Dispense the proper proportion of resin & hardener: 1 pump stroke of resin + 1 pump stroke of hardener results in the proper mix ratio when using calibrated pumps. Careful measuring of resin and hardener and thoroughly mixing epoxy are essential for a proper cure. Whether the resin/hardener mixture is applied as a coating or modified with fillers or additives, observing the following procedures will assure a controlled and thorough chemical transition to a high-strength epoxy solid. Dispense the proper proportions of epoxy resin and hardener into a clean plastic, metal or wax-free paper container. Don’t use glass or foam containers because of the potential danger from exothermic heat build-up. DO NOT attempt to adjust the epoxy cure time by altering the mix ratio. An accurate ratio is essential for a proper cure and full development of physical properties. Dispensing with Mini Pumps – Most problems related to curing of the epoxy can be traced to the wrong ratio of resin and hardener. To simplify metering, we recommend using calibrated WEST SYSTEM Mini Pumps to dispense the resin and hardener. Mini Pumps are calibrated to deliver the proper working ratio of epoxy resin to hardener.Pump one full pump stroke of resin for each one full pump stroke of hardener. Depress each pump head fully and allow the head to come completely back to the top before beginning the next stroke. Partial strokes will give the wrong ratio. Read the pump instructions before using pumps.Before you use the first mixture on a project, verify the proper ratio according to the instructions that come with the pumps. Re-check the ratio anytime you experience problems with curing. Dispensing without Mini Pumps (Weight/volume measure) – To measure 105 Resin and 205 Fast Hardener or 206 Slow Hardener by weight or volume, combine five parts resin with one part hardener. To measure 105 Resin and 207 Special Clear Hardener or 209 Extra Slow Hardener by volume, combine three parts epoxy resin with one part hardener (by weight, 3.5 parts resin-1 part hardener). If this is the first time you have used WEST SYSTEM epoxy, begin mixing epoxy in a small test batch to get the feel for the mixing and curing process, before applying the mixture to your project. This will demonstrate the hardener’s open time for the temperature you are working in and assure you that the resin/hardener ratio is metered properly. Mixing epoxy in small batches is a good way to gain confidence in the mixture’s handling characteristics. If you have any questions about selecting or using WEST SYSTEM products that you can’t find the answers to, contact our technical staff by email or by calling 866-937-8797 toll-free Monday-Friday, 9:00 AM to 5:00 PM EST. When mixing epoxy stir resin and hardener together thoroughly: at least 1 minute. Mix epoxy longer in cooler temperatures. Stir the two epoxy ingredients together thoroughly—at least 1 minute, and longer in cooler temperatures. To assure that you’re mixing epoxy thoroughly, scrape the sides and bottom of the pot as you mix. Use the flat end of the mixing stick to reach the inside corner of the pot. If you are using a power mixer, occasionally scrape the sides and corners of the mixing pot while mixing. If you are going to be using the epoxy mixture for coating, quickly pour it into a roller pan to extend the open time. Warning! Curing epoxy generates heat. Do not fill voids or cast layers of epoxy thicker than ½”—thinner if enclosed by foam or other insulating material. Several inches of mixed epoxy in a confined mass (such as a mixing cup) will generate enough heat to melt a plastic cup, burn your skin or ignite combustible materials if left to stand for its full pot life. For this reason, do not use foam or glass mixing containers or pour into confined spaces. If a pot of mixed epoxy begins to exotherm (heat up), quickly move it outdoors. Avoid breathing the fumes. Do not dispose of the mixture until the reaction is completed and has cooled. It’s most common to mix epoxy in small batches, blending several ounces at once. This gets the job done 95% of the time. But for some projects, such as large laminating jobs, you may need large batches of epoxy. Before you begin, you should understand what’s involved in mixing big batches of epoxy. Mixing large batches requires careful planning because large batches cure faster than small batches. The key to slowing down epoxy’s cure is to create more surface area, exposing more of the mixture to the air. Epoxy will build up heat unless it is spread into a thin film or quickly poured off into multiple small containers. This allows the epoxy’s heat to dissipate, extending the working time. Because working time is shorter with large batches, it makes sense to use a slower curing hardener such as 206 Slow Hardener. To further extend the epoxy’s working time in warm temperatures, we recommend 209 Extra Slow Hardener. Read more about Big Batch Epoxy Mixing at Epoxyworks.com.